A car submerged in flood water in Kerala, India. Three Maldivian families residing in India have been affected by the flooding in the capital of Kerala, Trivandrum, reports Embassy of Maldives in India. Deputy Consulate, Jaadulla Thaufeeq reported to “Sun” this Wednesday that heavy rain has resulted in a river in Trivandrum to overflow, flooding the residences of three Maldivian families. Jaadulla said the members of the three families have moved to the first floor of their residences to escape from the flooding. He said their situation isn’t life threatening, but that they are facing difficulty preparing and eating food. Jaadulla said the Embassy is verifying the exact number of family members at each of the families, and assessing who needs to be moved to safer areas. He said the area where the three families are located has a system which will drain the flood water within four hours if the rain eases, but that it will take longer if the rain does not stop. 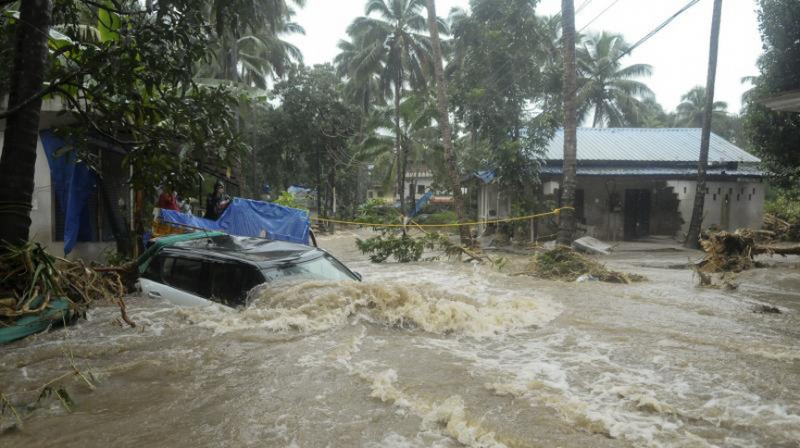 The official death toll from the rain, landslides and floods in 40.